The crowd's the great advantage of social media, a tool that means you don't have to do all the work, even as it invests the audience in your site. But on campuses across the U.S., communicators are debating whether they should let students blog on the school website--unedited. Will they do it for no pay? What if they say something, um, problematic? Shouldn't we just supervise and lightly edit them? We discussed the same questions earlier this year at a special training retreat I co-facilitated with Charlie Melichar for UMBC, the University of Maryland Baltimore County. In the past two months, UMBC has launched two ideas that grew out of that retreat: UMBCeats, a student-run blog about on- and off-campus food, and College.Be, a community crowdsourced by UMBC students with their tweets, photos, videos, blogs and music. And in both cases, the students power and supply the content. The new sites take two different approaches. College.Be works on an aggregator platform, so students can feed their existing photos, tweets, posts and other material into the site from their own or third-party sites. It's a crowdsourced destination where students--and prospective students, the real target of this effort--can dive into what's happening on campus from the perspective of many students. And while posts are monitored, they're not edited. UMBC posts its community standard (a term I wish more organizations would use instead of "social media policy") to define and explain what content should and should not include. And the posts reflect the full range of views you'd expect. 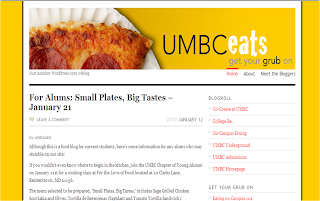 UMBCeats sits on a WordPress blog platform, and lets loose student perspectives on dorm food, campus cooking, on-campus restaurants, free food and off-campus eating options in Baltimore and Washington, DC. While some would consider this a dangerous topic (you remember mystery meat), it's also a sure-fire topic of interest, both on campus and in society. I remember this coming up at the retreat and reinforcing it as a keeper, so I'm especially delighted to see it served up for others to enjoy. The blog held a campus launch party with free cupcakes, cookie-shaped promotional pins and other materials to introduce itself and its student bloggers to the community. 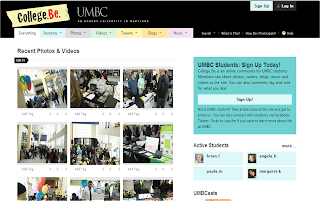 It also aims to build community while serving as a source for prospective students, with links to admissions, the main UMBC page, and a student-run blog on UMBC matters. UMBC's one of several clients who have asked for social-media staff training, an orientation in how others in its sector use social media to reach key audiences, facilitated brainstorming and the creation of pilot projects. Armed with that background, the UMBC public relations, marketing and alumni teams at the retreat have been busy using online video, Twitter, blogs and Facebook for a variety of purposes, reaching arts, alumni, news media and other audiences (and a clever omnibus Twitter account, UMBC Tweets, that aggregates all its tweets from various accounts, saying "we do the work for you"). 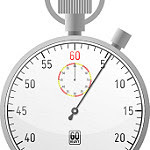 If your organization needs the focus of a customized retreat on social media applications for your communications, contact me at info[at]dontgetcaught[dot]biz for more information. I'm delighted to see these great examples of UMBC's creativity in letting students take the social-media wheel. It's been great working with you over the past few months, Denise. I'm so glad our ideas have come to fruition, and I look forward to seeing what the outcomes may be. Thanks again! Helping clients come up with great strategies--and reinforcing their smart ideas with tools to move them foward--are my favorite kinds of work, Rose! I'm just delighted to see UMBC's leaps forward in social media, with more to come, I know.